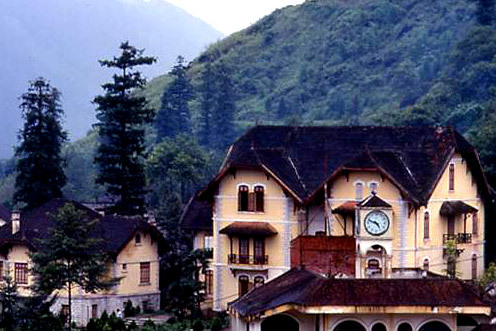 Victoria Sapa Resort is the only luxury hotel in North-Western Vietnam, opened in March 1998. Built as a traditional mountain chalet with accented wooden décor and a welcoming stone hearth fireplace, Victoria Sapa Resort overhangs the village, blending perfectly with the natural surroundings. All guest rooms with private terraces offer views over Sapa village, the resort’s lush gardens or Mount Fansipan. Staying at Victoria Sapa Resort, guests will experience the difference and the unique of a place in close harmony with nature and with the local hill tribe people. Victoria Sapa Resort features 77 stylishly designed rooms, each with private terrace, wood flooring and a warm touch of local decoration. Guests will feel at ease in the “mountain chalet” atmosphere. All guest rooms offer views over Sapa village, the resort’s lush gardens or Mount Fansipan. Deluxe: 53 rooms at second and third level with a comfortable sitting area with a sofa, a large writing desk and a balcony with a sofa; 25 m2. The Fansipan Ballroom, with its fully equipped and modern meeting facilities, is the ideal venue for seminars, meetings and events in Sapa. Ta Van restaurant - has a large central fireplace and spectacular mountain views from the terrace. The restaurant offers a variety of European and Asian cuisines with Cheese Fondue as a specialty. In the summer months you may dine on the terrace, with a view over Mount Fansipan. Especially, there is Minority Dance Performance performed every Saturday night at Ta Van Restaurant from 8.30 PM until 9.30 PM by H'mong and Thai Minority people. Ta Fin bar - Enjoy a glass of hot red wine by the fireplace after a day of sightseeing in the Sapa region. Victoria Sapa Resort offers a fine wine list including Victoria Hotels & Resorts exclusive Private Wine Collection: the exquisite Bordeaux Millesime 2003 and Chardonnay Millesime 2004, sparkling wines and great European, Australian, New Zealand, Chilean and South African wines. Refresh your soul and body with a revitalizing Spa experience at our Spa Centre. There are various treatments to suit your needs. Victoria Sapa Resort is located in Sapa, 380 km Northwest of Hanoi, among the Hoang Lien Mountains, in Lao Cai Province, near the Chinese border.